A few years ago, before kids, Fran and I rode our bikes across Devon, her home county, in southwest England. It was lovely as we embarked from Tiverton Parkway in the east of the county, but as soon as we reached Exmoor, having climbed steeply from the village of Dulverton, the wind and rain set in. 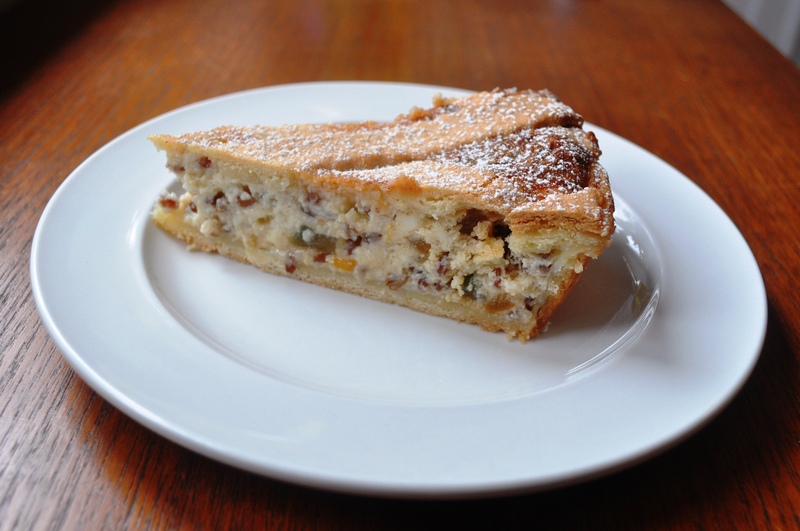 Although this pudding is named after the moor, it’s hard to imagine it’s a place where many apples are grown. Sure there are some orchards within the confines of Exmoor National Park, but by and large the moor itself is, along with other West Country moors Dartmoor and Bodmin moor, is about as close to wilderness as you can experience in southern Britain. We certainly didn’t pass any orchards as we fought a fierce headwind. 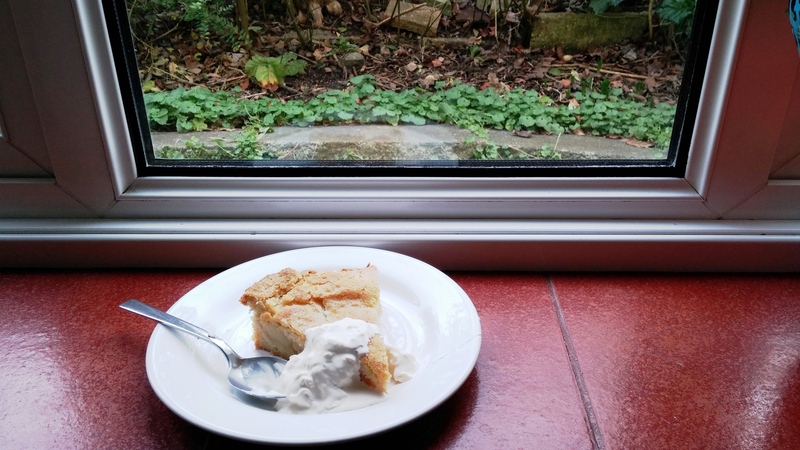 I made this pudding with apples from my parents’ tree, in Winchester, Hampshire. It would have been hard to find Exmoor apples. Indeed, for crying out loud, it’s hard enough to find English apples in the supermarkets at the moment, despite it being apple season. I live in the southeast of England, in East Sussex. 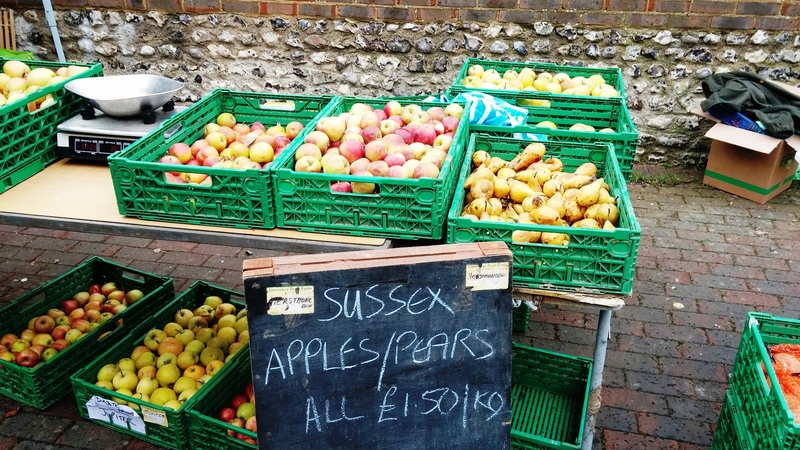 The adjacent county, Kent, is the historical heartland of apple cultivation – and yet our local supermarkets are filled with apples from France, Chile, South Africa and even New Zealand. This madness makes me want to scream. I suspect I’ve ranted about it here before. Talking of madness: Brexit*. Will it mean fewer food imports as costs increase? Will it encourage domestic food production? Who knows. No one seems to know what’s going to happen, apart from an abiding smugness from aging little Englanders as we metaphorically unmoor ourselves and drift away into deepening obscurity. Anyway, back to the apples. My folks have a magnificent Bramley tree. While picking, I managed to fall off the ladder, knocking over not just my toddler, T-rex, but also my seventy-something dad. Sorry guys! Still, it’s great fruit. We should be celebrating home-grown Bramleys more than ever now following the news this summer that the original Bramley tree in Nottinghamshire is dying of a fungal infection, having been sown in 1809. 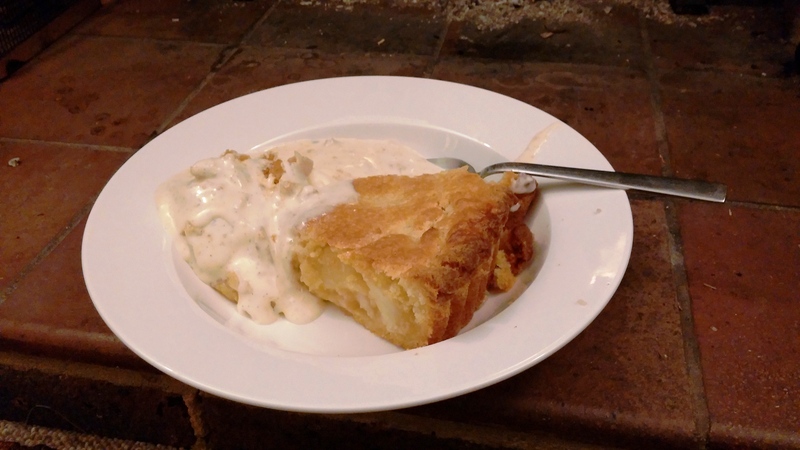 This is a lovely variation on the theme of apple pudding involving a cake-like mixture. The mixture has the distinction of by being made with rich, caramelly demerara sugar. It also contains some ground almonds, one of my favourite ingredients. Some Exmoor in and out puddings also contain suet. 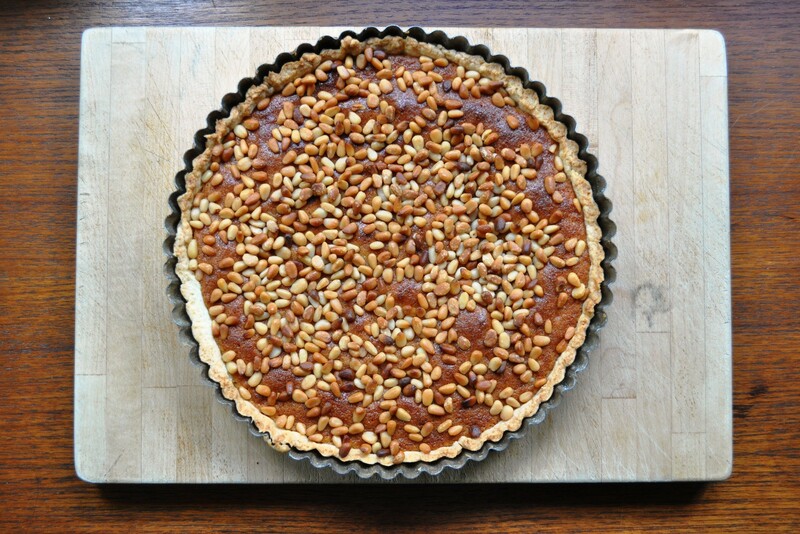 This recipe, based on one found in the National Trust’s Complete Traditional Recipe Book by Sarah Edington, doesn’t. 2. Peel and slice the apples. 3. 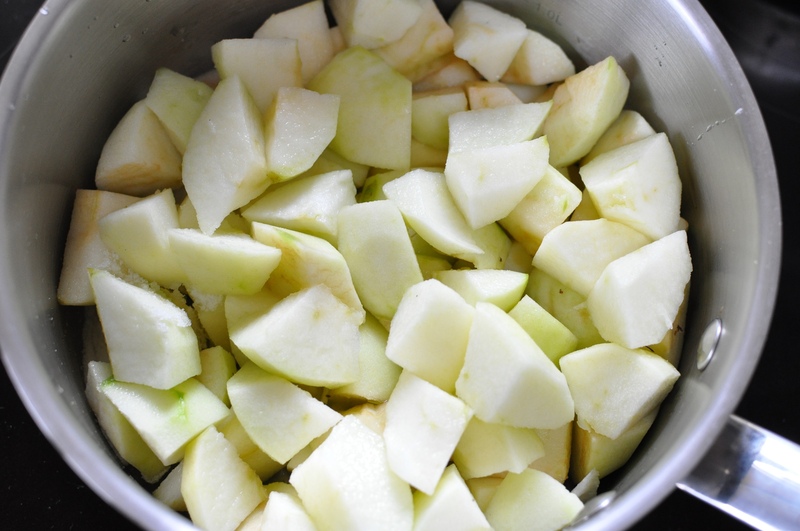 Combine the apple slices, cinnamon, demerara and apple juice or water then put into an overproof dish. Cover with a damp cloth so the apple doesn’t brown while you prepare the topping. 4. Cream together the butter and other portion of demerara sugar.
. Lightly beat the eggs, with the almond essence, and slowly beat into the mixture. If it starts to curdle, add some of the ground almonds. 6. Add the ground almonds and sieve in the flour. Fold to combine. 7. Put the topping on the apple mix. 8. Sprinkle with ground almonds. 9. Bake until the top is nicely browned and the cake is firm to the touch, about 40 minutes. 10. Serve warm with cream, ice cream or even custard. * As well as the actual process of the UK leaving the EU upsetting me, I detest the ugly neologism “Brexit”. But I can’t come up with a better, succinct alternative, so we’re stuck with it. We had a pretty good summer in southern England this year, with very little rain and a reasonable amount of sunshine July to October. 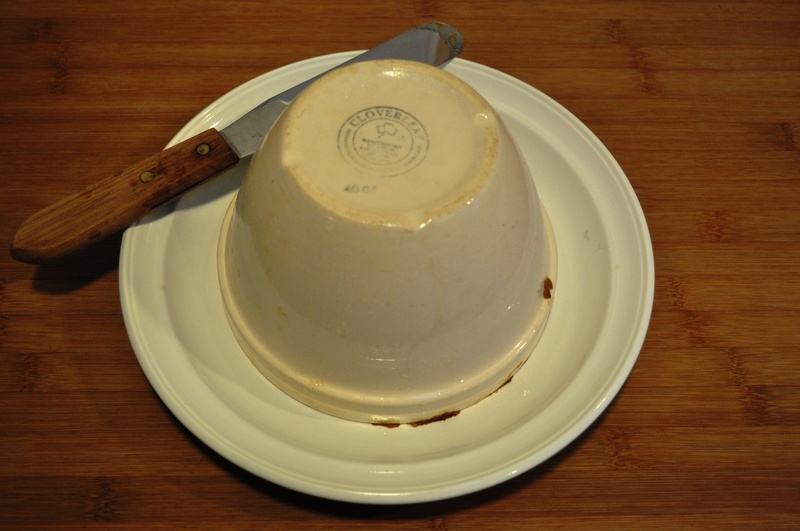 But now it’s definitely Autumn, with winter round the corner and that means one thing: steamed puddings! OK, maybe not just one thing, but I do crave serious stodgy English puddings in the winter. 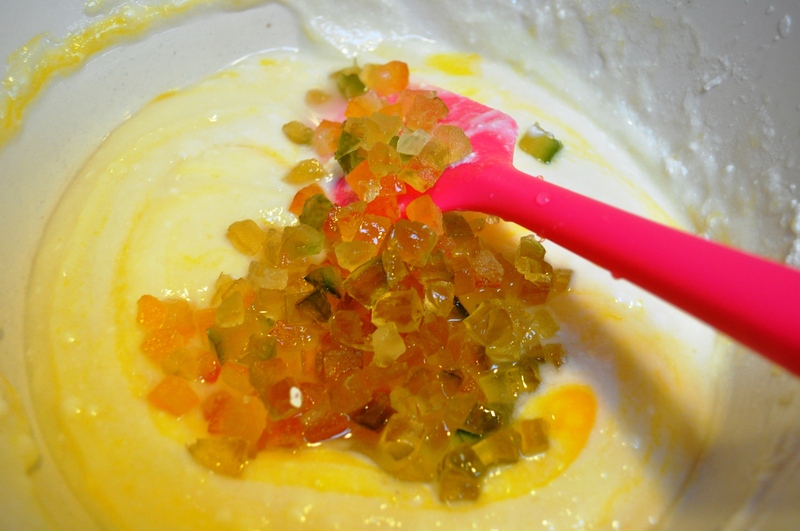 Growing up, a favourite was treacle sponge – actually a steamed pud made with golden syrup. It’s a recipe I revisit regularly, and frequently use as the basis for variations on a theme, adding things like stem ginger, other fruits and spices. Since the end of last winter, my kitchen whiteboard has featured an increasingly faint scribble saying “date and maple syrup steamed pudding”. This weekend we had a lovely visit from our friend Mary Margaret, who Fran worked with in Rome. She’s Canadian. So of course that’s a good excuse to reach for the maple syrup. MM said she hadn’t had a traditional Canadian Thanksgiving this year (10 October), so our Sunday roast stood in for it. She was very satisfied with my entirely non-traditional date and maple syrup pudding. 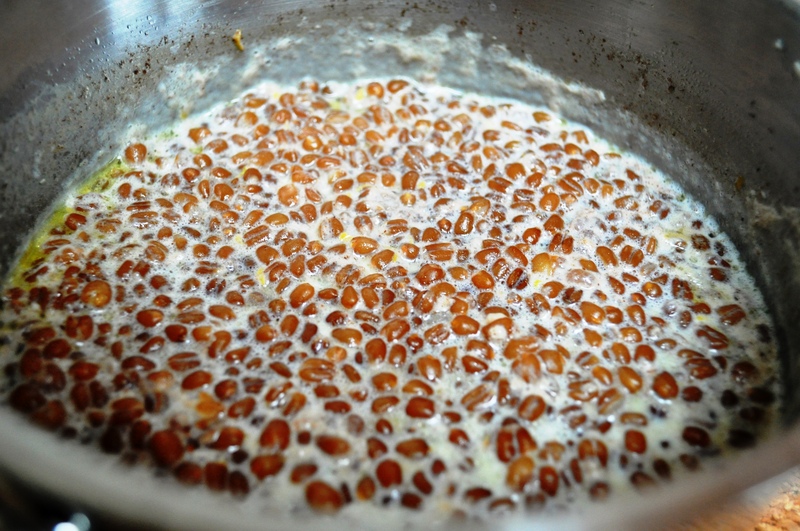 The dates were chopped and soaked in boiling water with half a teaspoon of baking soda. This is a technique used when making sticky toffee pudding, another classic stodgy English pudding. Which probably had its origins in a Canadian recipe. I do include a bit of golden syrup here as it’s thicker than maple syrup and I felt it’d help with the texture but if you live somewhere that it’s not available (the US, I believe), just use all maple syrup. It’s a pretty forgiving recipe. 1. Put the dates in a bowl, add the baking soda and cover with boiling water. Leave to soften. 2. Grease a 1.2 litre pudding basin with butter. 3. Put the syrups in the bottom of the basin. 4. 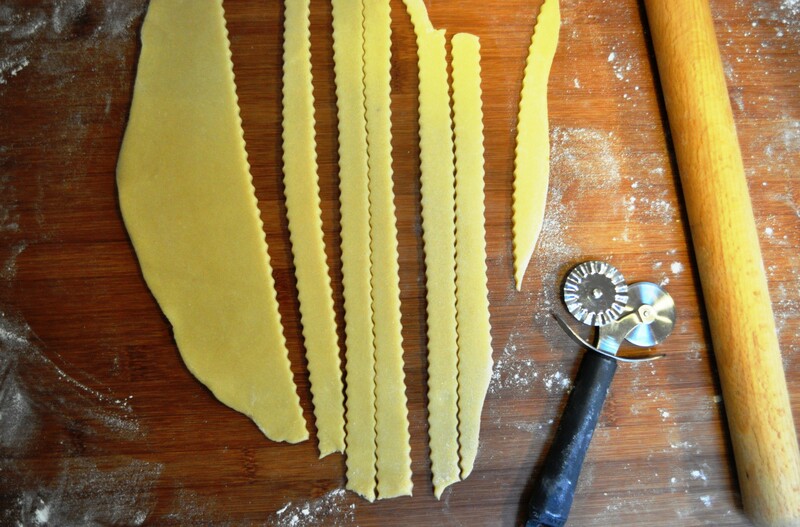 Beat together the softened butter and sugar until light and creamy. 5. Add the beaten egg a little at a time, continuing to beat. If it starts to curdle, add a little flour. 6. Sieve together the flour, baking powder and spices, then sieve this into the beaten mixture, along with a pinch of salt. 7. 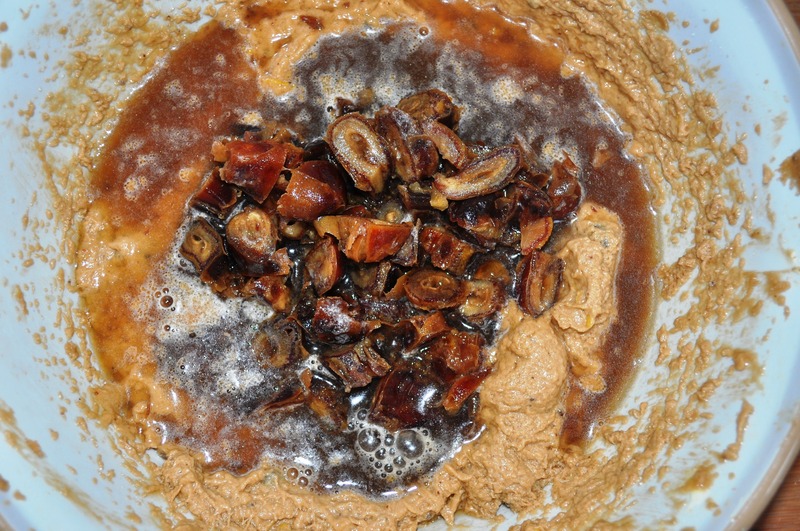 Strain the dates and add to the mixture. 8. Fold to combine. If it seems a bit firm, add some of the date liquid or a splash of milk. 9. 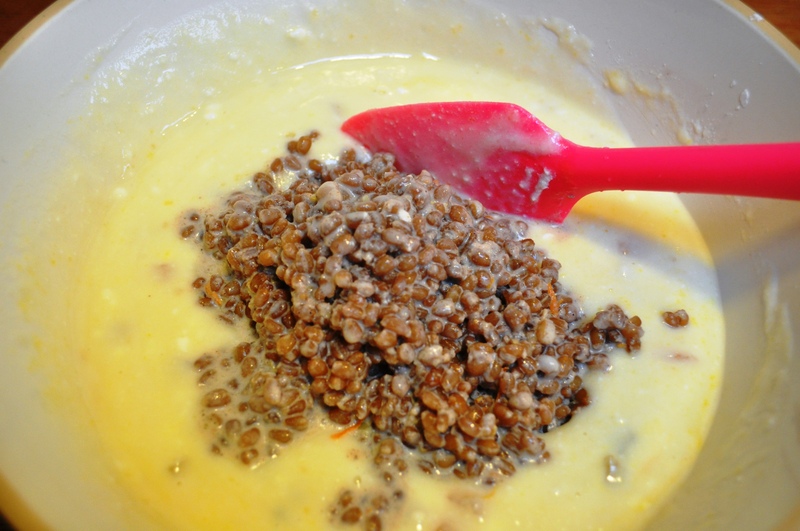 Put the mixture in the pudding basin. 10. 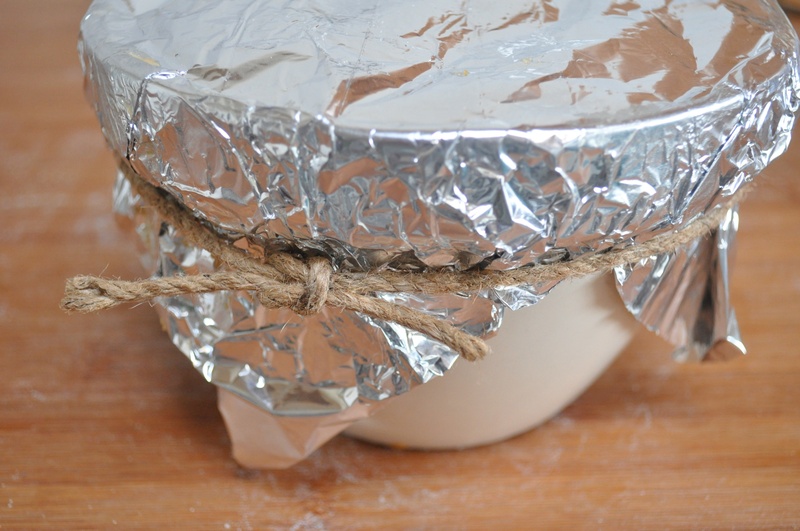 Cover the basin with a piece of foil, with a pleat in it. You can tie the foil on, but I’ve given up these days. 11. Put the basin in a large saucepan with some boiling water, or in a steamer over a saucepan, and steam for about 2 hours. 12. Remove from the saucepan and lift the foil. 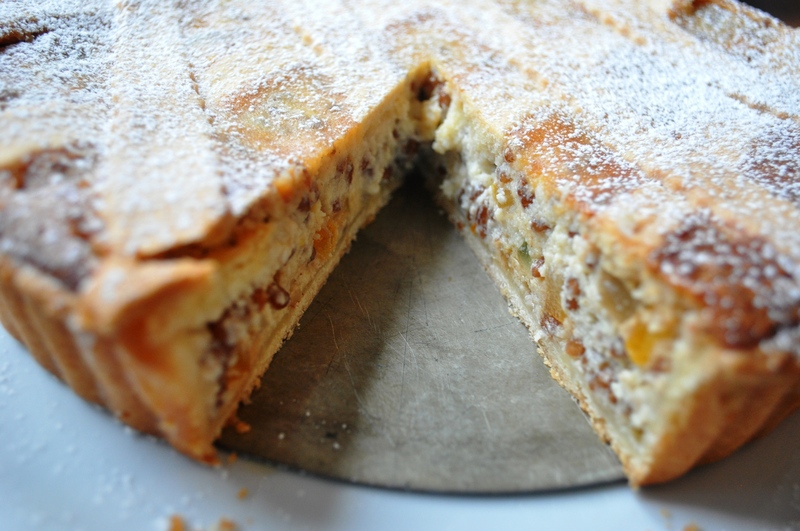 The top should be fairly firm and cakey. 13. Turn out onto a plate. Christmas is looming. Father Christmas, or Santa Claus, is waiting to do the impossible and deliver gifts to millions of kids on Christmas Eve. Santa is a slightly baffling modern evolution of St Nicholas, who was in fact born to a Greek family, in what is now part of Turkey but was then part of the Roman Empire, in the late 3rd century. St Nicholas’ feast day is actually 6 December (in Western Christianity; 19 December in Eastern Christianity) and in many cultures that date is still a big deal, with celebrations and special baked products: speculoos biscuits in the Netherlands; ciastka miodowe, honey cakes, in Poland; and vanilkove rohlicky, vanilla crescent biscuits, in the Czech Republic, among others. Even here in England there was apparently1 a traditional pudding – though I can’t imagine many people still make it for 6 December. Which is a shame, as it’s rather good, and could even make a good alternative to the traditional British Christmas pudding – a heavy, alcohol-infused concoction I’ve never liked. 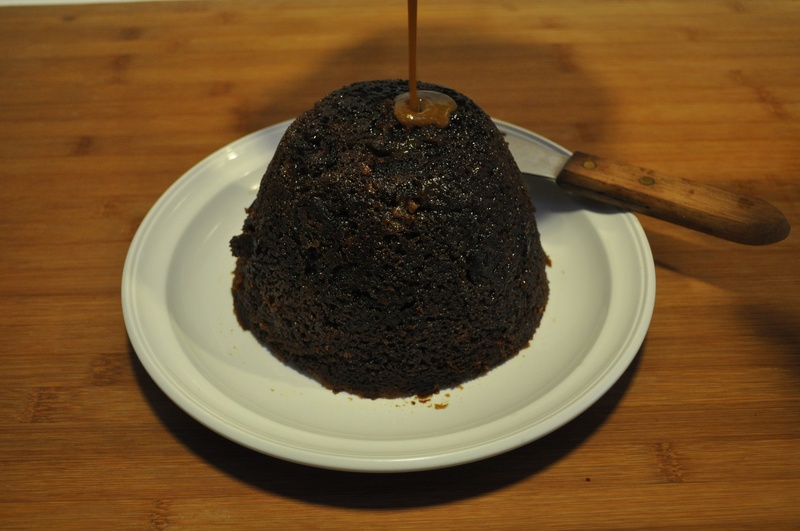 Traditional British Christmas pudding is often called “plum pudding” – though its main fruit component is raisins, not plums. It gets the name as in older English “plum” was used to mean raisin, or dried fruits in general. St Nicholas pudding, on the other hand, is a genuine plum pudding. I’m slightly confused by this as the plums on our Victoria tree were all ripe in August, and while there are later varieties, any fresh plums in early December would surely have been imports – but importing fruit was a less commonplace activity in Olde England than it is now in our industrial, seasonality-quashing modern world. More likely, it used prunes – dried plums. This recipe uses both. Luckily I had 3kg of our plums stoned and frozen from August. Like Christmas pudding, this is a steamed pudding2 so it’ll need a good 2 hours cooking time. Plan ahead! 2. Add the zest of the orange. 3. Add the egg a little at a time. 4. Sieve together flour, baking powder and spices, and add to the mixture, along with the breadcrumbs. 6. Add the orange juice, plums and prunes and mix gently until well-combined. 7. Grease a pudding basin, then put the 80g (two generous tablespoons) of golden syrup in the bottom. 8. Arrange the halved 6 plums or prunes in the syrup. 9. Spoon the batter onto the top. 10. Seal with foil and tie. 11. Steam for approx 2 hours. 12. 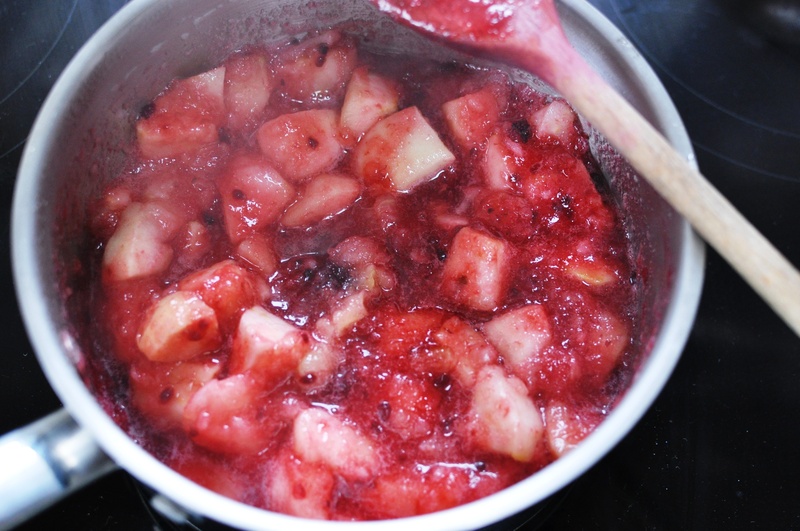 Make the sauce by slicing plums into saucepan, with a little water. Simmer until well softened then puree by putting through a mouli, or blending and putting through a strainer. 13. Dissolve the sugar with about 60-80g water. When it’s dissolved, turn up the heat and boil to caramelise slightly. 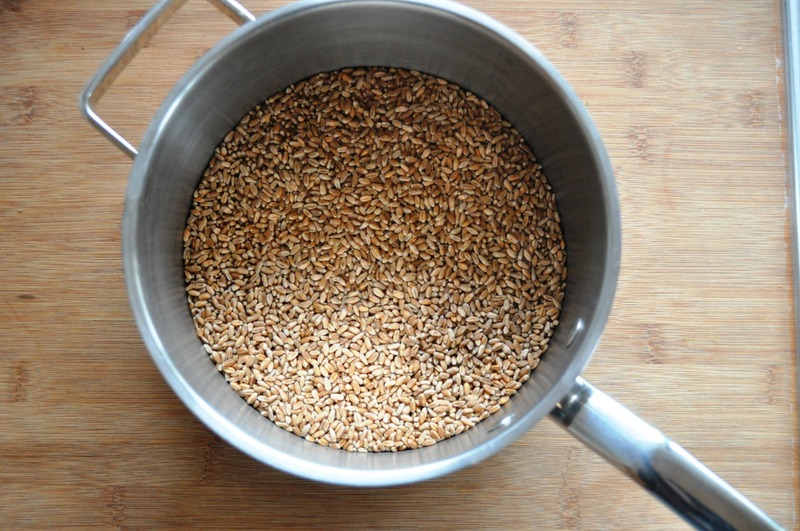 Remove from the heat, stir in about 60-80g more water – carefully, as it’ll spit. 14. Add the plum puree to the syrup, and stir well to combine. You can add some booze if you like – port, Kirsch, a dash of brandy. 14. Check if the pudding is cooked by lifting the foil and sticking in a skewer; it’s basically a moist cake, so the skewer won’t come out clean – but nor should it come out with bits that still resemble batter. If it’s still battery, keep steaming. 15. When the pudding is cooked, turn it out onto a plate and serve with the sauce. 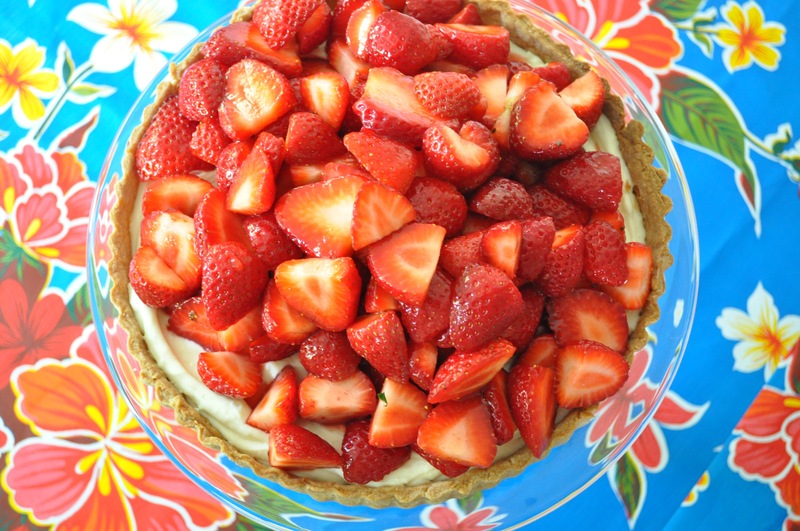 You could even serve with some cream or vanilla ice cream, if you’re feeling really indulgent. It’s a lovely pud, with the orange, and possibly the caramelised sugar, tempering the sweetness of the sugar and syrup and adding some bitterness. 1 I say apparently as although a recipe appears in my 1997 copy The Pudding Club Cookbook, and that one is essentially copied in Cooking With the Saints (Ignatius Press, 2001), I can’t find any mentions of the pudding in my books of older traditional British recipes. 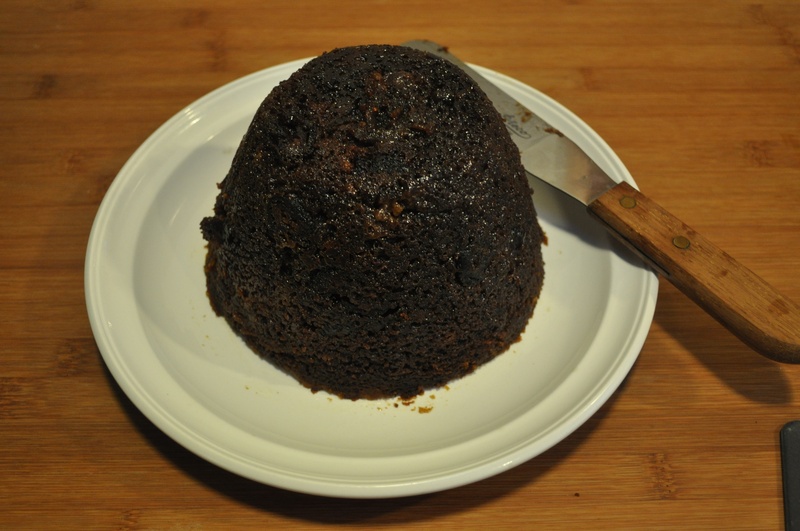 2 OK, some Christmas puddings are boiled still. See this post for more discussion of just what is meant by “pudding” and its history. Autumn has seized us now in the south of England with its cool, slightly soggy grip. We’re also going through a disheartening time in our adoption process, so it’s definitely time to embrace the comfort foods. 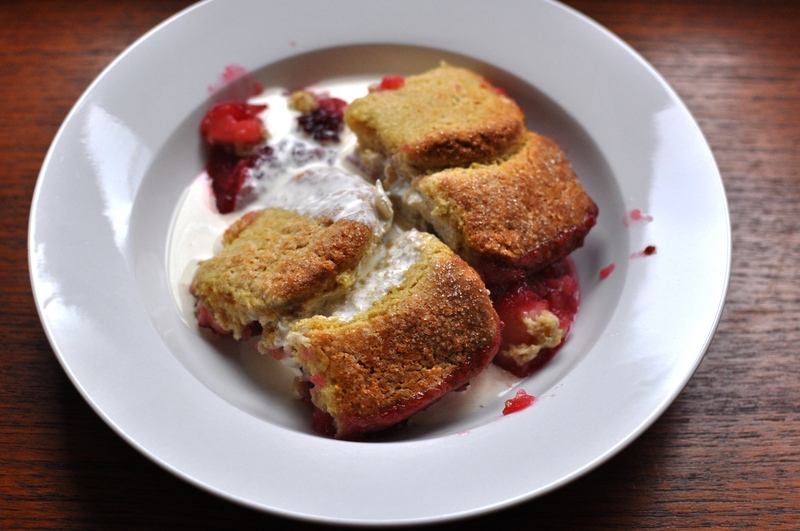 One such stodgy autumnal comfort food is cobbler. 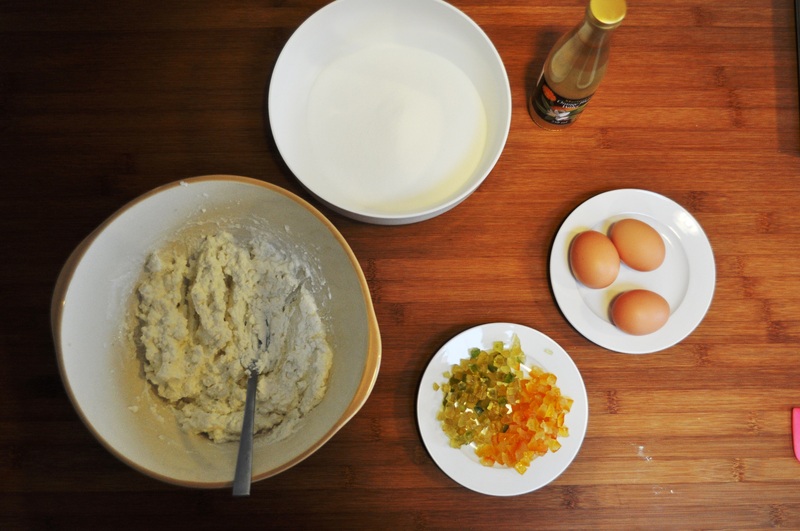 Cobbler is simply a variation on the theme of a pie – that is, a sweet or savoury filling covered with a flour-based topping or crust. But in this case, the crust consists of a scone-type mixture. 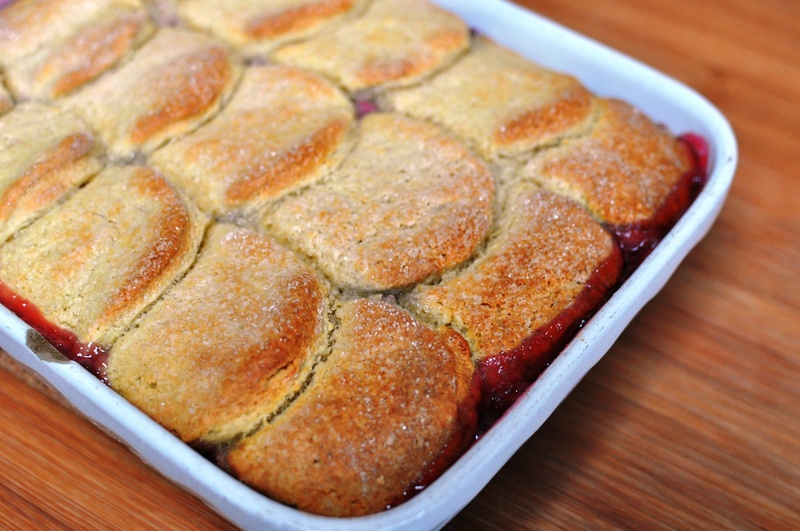 A lot of cobbler recipes use a moist dough, put on top of the filling in the form of rough blobs. Somewhere along the way, however, I latched onto the idea that the mix should be a drier dough, rolled out, and cut like scones, then put on top of the filling in a form more like shingles or roof tiles. Maybe it came from an old Katie Stewart recipe. Stewart is one of Britain’s more unsung food writers, but her recipes in The Times in the 1970s and early 1980s, which my mother collected in a yellow binder, were another key part of my cookery education. Stewart even has a book called Wild Blackberry Cobbler and Other Old-Fashioned Recipes, published 1984. I don’t have it, so can’t verify my hunch that the tiled-style cobbler comes from her, but I am using some wild blackberries here. It’s been a good year for blackberries, and we’ve had a few productive foraging sessions. This weekend just gone Fran and my mum gathered some more blackberries, along with rosehips and sloes, which we used to make hedgerow jelly. They got the blackberries on the last day you’re supposed to pick them, according to one strand of British folklore: 11 October. Others say 10 October. These dates used to be when St Michael’s Day, Michaelmas, was celebrated. The Catholic calendar was, however, revised in 1752, and Michaelmas became 29 September. So some say that’s the last day you should pick blackberries. Michaelmas is supposedly the day when St Michael kicked Lucifer out of Heaven. Some say he landed on a blackberry bush and, angered by the thorns, cursed it, spoiling the fruit. Either way, I’m using some of my blackberry jam made in August in this one, so I think we’re safe from any demonic saliva. 1. Vary the fruit according to season, what trees you’ve got, what trees your friends or family have got, or what you can forage. Right now, in the thick of the apple harvest, I used 800g Bramley apples from a tree in my folks’ garden. Peel, core and cube the apples, then stew in a pan with a dash of water and sugar to taste (I used 40g). 2. Cook until softened but not completely broken down. 3. I mixed the apple with a few tablespoons of blackberry and plum jam. 4. Spread the fruit mixture in a 20x25cm ovenproof dish. 1. Sieve together the plain flour and baking soda in a bowl. 2. Add the pinch of salt and caster sugar and stir to combine. 3. 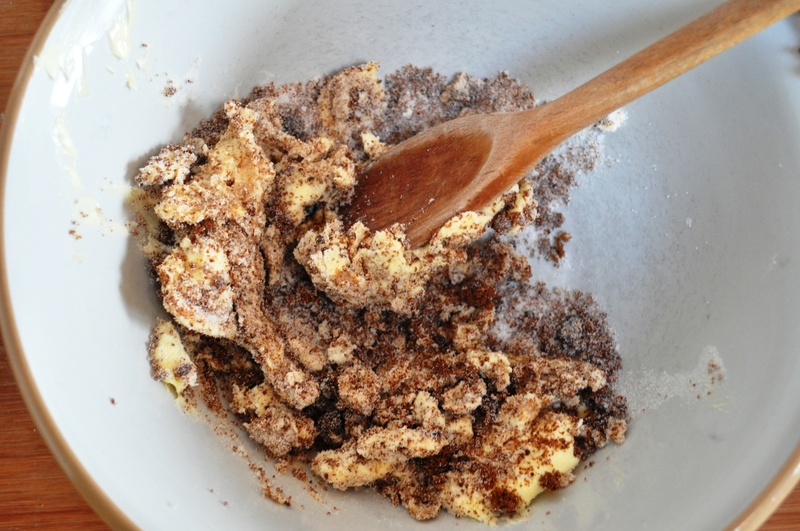 Cut the butter up into small pieces, then rub in until the mix resembles breadcrumbs. 4. 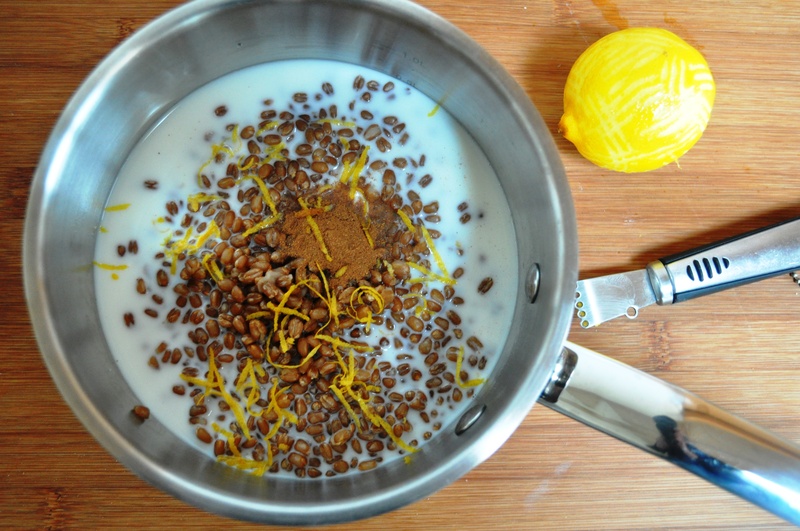 Mix together the milk and yogurt (you could use 160g buttermilk instead) then add this to the mix. 5. Bring together to form a dough, kneading very briefly. If you handle it too much it’ll toughen up. 6. Roll out the dough to about 12mm thick. 7. Using a cookie cutter, cut discs. I used one 65mm wide, but use whatever you’ve got. 8. 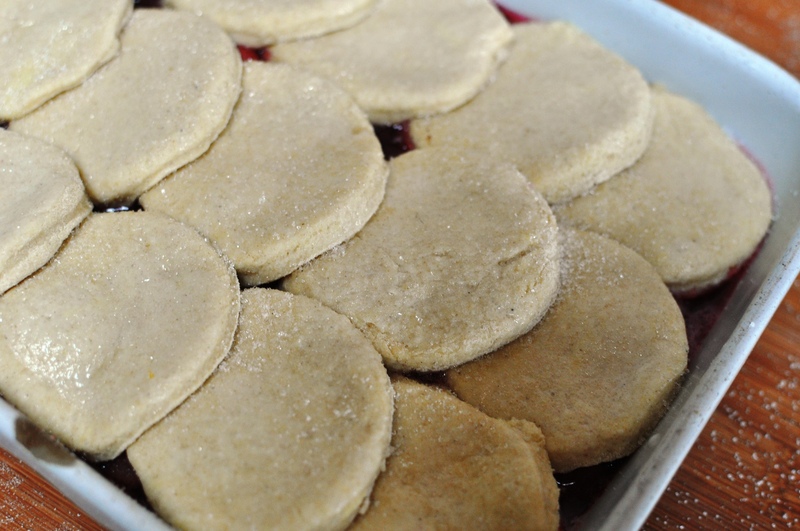 Cover the fruit mix with overlapping discs of cobbler dough. 9. Brush the dough discs with milk and sprinkle with granulated sugar. 10. Bake until browned, about 20 minutes. The past three weekends I’ve done sticky toffee pudding for Sunday lunch. This is in part because it’s a delicious pudding, but also because, well, January is a horrible time of year in Britain: Christmas festivities are behind you, it’s cold, it’s dark, it’s dank. If there’s a time of the year when you can justify indulging in sweet stodge, it’s now, you need that carb comfort. Save your de-toxes and dietary self-deprivation for a nice time of the year – May or June say, when there’s new life, new growth, longer days, more light. 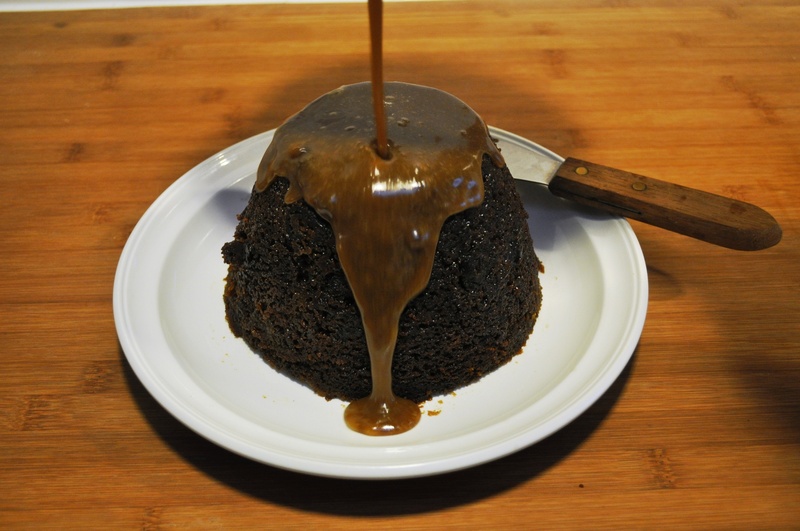 Sticky toffee pudding is usually made by baking a batter, which gets its character from the inclusion of dates that have been soaked in boiling water, with a toffee sauce poured over the finished cake. The past few weeks I tried Felicity Cloake’s recipe, which is great, but not perfect (there’s not enough sauce for starters) then my own baked version (below). But it got me thinking, what about a steamed version? I grew up eating treacle sponge pudding, a steamed pudding where you put golden syrup into a pudding basin, then cover it with a batter and steam it. The result is genuinely sticky, and lovely, and a must in winter. I wanted to try the same with sticky toffee, putting some of the sauce into the basin before cooking to give a similar result. Steaming is an old-fashioned way of cooking puddings that’s not that common now. It takes longer than baking, so make sure you check the timing of your meal as it’s always nice to serve a steamed pudding straight away, turned out and freshly oozing and steaming. When I made this on Sunday, to accompany a bonanza of pork smoked by Fran and her brother Al, I failed miserably with this as we were playing in the park and I left it too late. This one is made in a 1.2 litre pudding basin, so it takes a while for the heat to cook the batter all the way through: mine took four hours. This sort of cooking is especially good if you have a range cooker or woodburner, where a pan can just steam away quietly with no extra energy demand. We’ve got an induction hob now, which is very energy efficient, so steaming is a good choice. On more conventional cookers, too, it’s no so bad, as it only requires a low flame. 1. Grease a 1.2 litre pudding basin. 2. 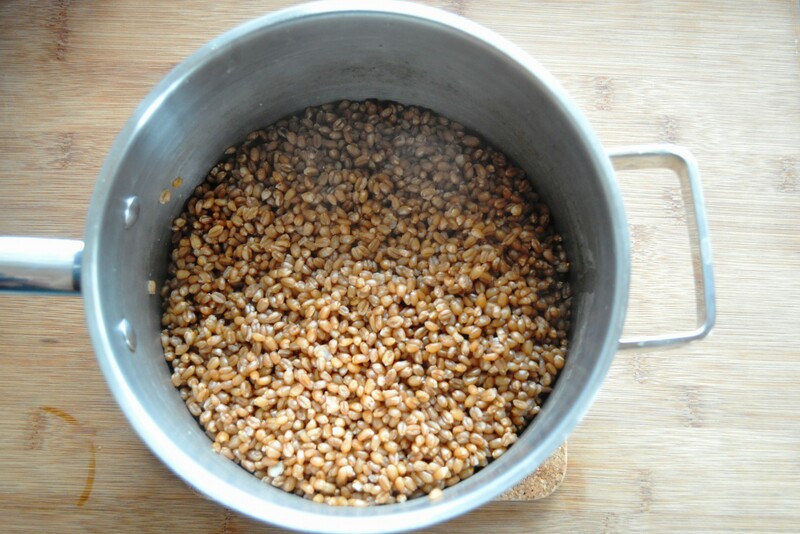 Put the dates and bicarb in a bowl, pour over the boiling water and leave to soak for at least 10 minutes. 3. Make the sauce by combining the cream, butter and sugars in a saucepan and heating slowly on the hob. When all melted, increase the heat to a boil and cook for 5 minutes. 4. Put about 4 tablespoonfuls of the sauce in the base of the basin and leave the rest in the pan for serving. 5. Make the batter by creaming together the butter and sugars until light. 6. Add the beaten egg, along with the vanilla and lemon zest, a little at a time. Add a little of the flour if it starts to curdle. 7. Sieve in the rest of the flour and fold it through. 8. Pour all the date gloop into the batter and blend. It’s not the nicest looking batter, but don’t worry, it’ll taste great. 9. Put this batter into the basin. 10. Cover the basin with a piece of foil or parchment, with a pleat in it, and tie a piece of string around the rim, to secure. 11. To steam the pudding, I just use a vegetable steamer set over a pan over simmering water, but you can also use a large pan, with a heatproof plate set in the bottom, and filled with water to half-way up the pudding basin. 12. Steam for about 3 1/2 hours. If it’s not cooked through it can collapse, ruining your ta-da! moment, so take the basin out of the steamer, remove the string and check the mixture. You should be able to see very clearly if the batter hasn’t quite turned into sponge pudding yet. If it hasn’t reseal the foil and continue to steam. 13. When the pudding is almost cooked, warm up the sauce again. 14. Turn the pudding out onto a warmed plate, and serve immediately. Either pour the sauce over the pudding before cutting it, or pour the sauce over individual wedges. 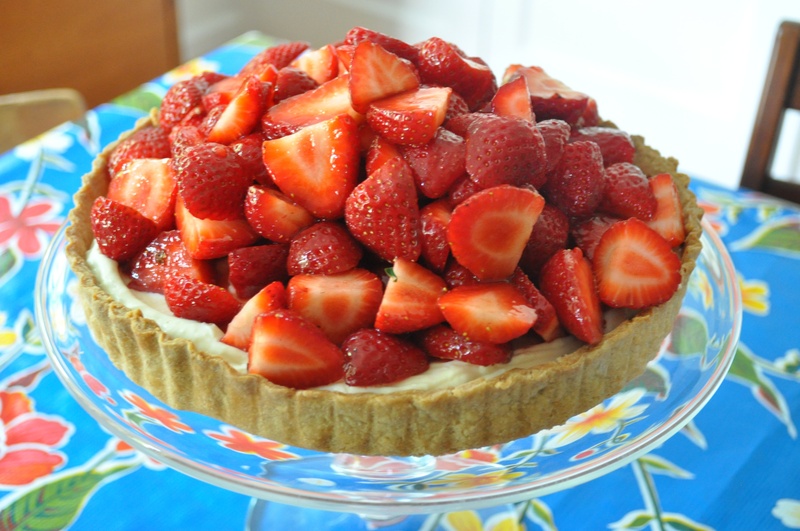 For added decadence, add a blob of whipped cream, clotted cream or vanilla ice-cream. The result is good. 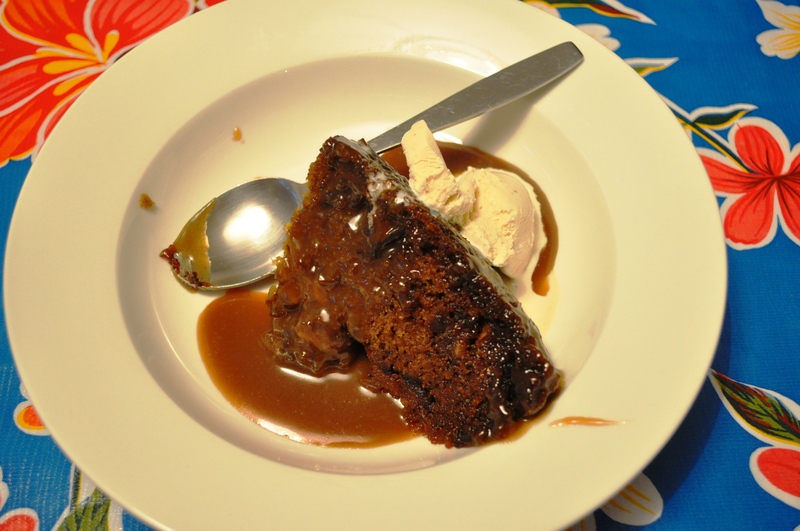 It’s considerably more sticky than a normal, baked sticky toffee pudding, which relies on the sauce for any stickiness. This is sticky all the way through, it’s denser, gooey, oozey. I’m not saying it’s better, it’s just suprisingly different considering how the flavours are the same: it’s just a question of texture. Make them both, compare, enjoy the sugary, stodgy winter foods! 3. Put the dates and bicarb in a bowl, pour over the boiling water and leave to soak for at least 10 minutes. 3. Cream the butter and sugars, then add the beaten egg, along with the vanilla and lemon zest, a little at a time. Add a little of the flour if it starts to curdle. 4. Sieve in the rest of the flour and fold to it through. 5. Pour all the date gloop into the batter and blend. 6. 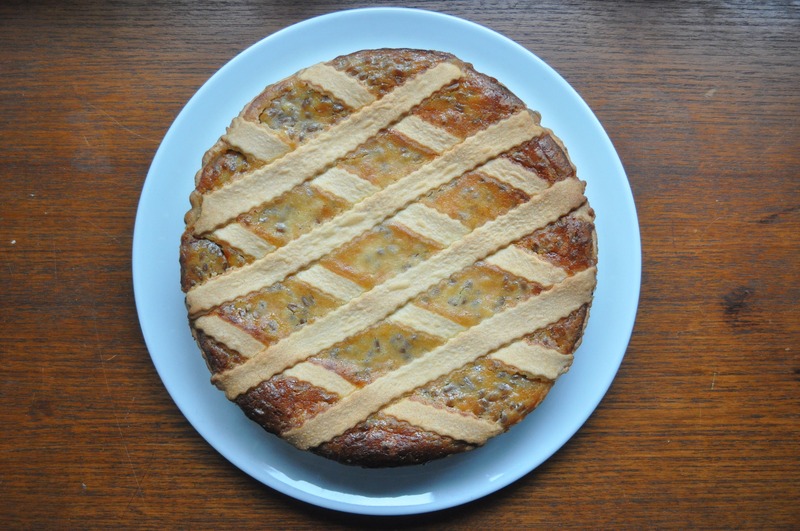 Put the sloppy batter in a 22cm-ish square tin lined with parchment and bake for about 50 minutes or until risen and firm and a skewer comes out clean. If it’s starting to brown too much but not baked through, cover with foil and leave in the oven some more. 7. Meanwhile make the sauce by combining all the ingredients in a saucepan, heating them to melt. When all melted together, bring to the boil and cook for about 5 minutes. 8. When the cake part is baked through, remove from the oven. 9. Serve the cake warm, cut into chunks, with the sauce poured over and a blob of thick cream, ideally clotted cream, or with vanilla ice cream. Oh, and for any North Americans struggling with my British English use of the word “pudding”, check out this post. * Converting plain/all-purpose flour to self-raising involves replacing 5% of the flour with baking powder. I wrote a whole post on it here. As 5% of 175g is 8.75g, which is a bit awkward. So as a teaspoon is 5 ml, or effectively 5g of powder, let’s just call it 1 1/2 teaspoons (sure, that’s closer to 7.5g, but it’ll be fine when steamed. If you’re fussed, just heap up your teaspoon a bit). When we got back from our travels just before Christmas, we travelled back and forth across the south of England on the train visting family. I’ve got a vivid memory of looking out of the window into gardens backing onto the train line, and seeing numerous apple trees, leafless in the winter cold, and surrounded by a carpet of rotting fruit. When we finally moved back into our own house in Sussex, a similar sight met us with a tree in our garden. Clearly our tenants hadn’t been into apples. Or maybe they had – but like so many people, were inclined to buy plastic bags of New Zealand or South African or French (!!!! *) apples from the supermarket and ignore the free fruit growing just outside their own door. Britain has been going this way for decades now. And it’s a great tragedy. Britain, especially the south of England, has an ancient history of apple growing. Cider is synonymous with Devon and Somerset, for starters. Yet I’ve got another strong memory of driving through Devon and stopping for a picnic – beside an orchard of mature apple trees, one of them vast like an oak, all of them dropping their fruit into a rotting carpet in the grass. It’s not just the fruit that’s rotten though, it’s the supermarket-dominated system that somehow believes it makes more business sense – which is different to actual sense, common sense, or future-of-the-human-race sense – to waste or neglect or our produce that is. The past few years we’ve at least been discussing the waste that goes into supermarkets only selling standardised fruit and veg (apples and tomatoes of ruthlessly controlled sizes and colours, carrots without protrusions and nobbles, bananas with very specific curves, etc). But is it already too late? Most of us have already forgotten what it’s like to eat seasonally, never mind the brainwashing that arrises from only ever encountering these cosmetically “perfect” supermarket products. We’re so out of touch with food production. I mean, when was the last time Britons en masse grew their own fruit and veg? Probably during the Second World War’s Dig for Victory, with perhaps some efforts in the 1970s inspired by The Good Life. Now, it’s January, and the apple harvest here in England, usually August to October, is fading into a distant memory on the far side of Christmas. And yet, my local farmers’ market has one stall, Greenway Fruit Farm, that has a wonderful selection of apples. All are priced at £1.50 a kilo – which isn’t bad, as a quick scoot round mysupermarket.co.uk indicates all the UK supermarkets are selling apples at around £1.75 -£1.99 a kilo. Last year, Britain had a “bumper apple harvest” after a dry summer, so there really is no excuse to not be eating home-grown apples his year. Not all of these apples will necessarily be cosmetically so shiny shiny, but then real apples, grown through traditional means without gallons of toxic sprays and without a wax-job, will never look like those silly massive red things you see in American movies. We have 2,300 varieties here (listed in The National Fruit Collection in Kent; there 2,500 grown in the US, for comparison, and 7,500 worldwide) and they vary remarkably in appearance, flavour and use. Some great for eating, some for juicing, some for cider, some for cooking. Last week, I bought a good selection of Braeburns for eating. This variety is synonymous with NZ, where is was emerged in the 1950s near Motueka (a great place for fruit and hops), a Granny Smith-Lady Hamilton cross. It’s been grown here since the 1990s though, really coming into its own in the 2000s. Its popularity is understandable as it’s a medium-large, green and russet colour fruit with a crisp bite and taste that somehow blends sweet and tart, and can be a dessert apple and a cooking apple. For cooking, however, I also stocked up Bramleys. This variety was, perhaps surprisingly, developed from a seed planted only in 1809 by a girl in Nottinghamshire. They were first sold commercially in 1862, soon becoming established as a significant crop. The original tree is still bearing fruit. These are the quintessential British cooking variety, accounting for 95% of our cooking apples. Usually I get mine from my folks, who have a very handsome mid-sized tree in their garden that really cranks out bright green, occasionally pumpkin-sized fruit. The ones I bought on the market were a bit different though – the Greenway lady was excited about them as they had an unusual amount of red on their skins. They certainly worked wonderfully for an apple pie. The recipe I used this time was from Andy Bates and his Street Feasts TV shows, which we’ve been enjoying on Freesat since we got home, got settled and got a telly. 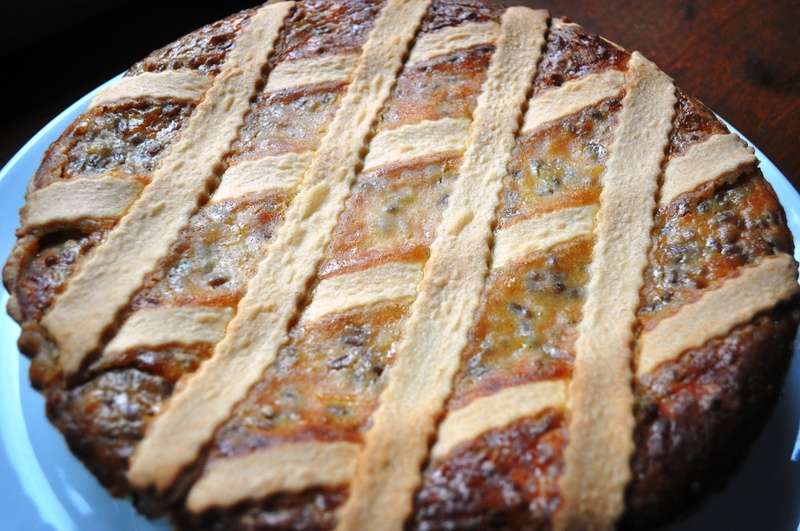 It features a slightly unusual pastry that eschews the more typical necessity for cold, cubed butter. Instead, butter and sugar are creamed together, egg is added, then self-raising flour – as such it’s more like a cake batter, though drier. The final results are more cakey too, with a more spongy crumbliness than a traditional short crumbliness. It’s rather good. His recipe also uses a filling that’s not too sweet. In the show, he explained that’s because he’s pairing it with an ice cream made with condensed milk and hokey pokey (aka honeycomb, you know, like the stuff inside a Crunchie bar). I did make the ice cream – it’s easy, with no custards, no churning, but it is insanely sweet, and his quantities are weird, there’s way too much honeycomb. You can find his original recipe here; if you do fancy making the ice cream, I’d recommend halving the quantities of honeycomb. 1. Cream together the sugar and butter. 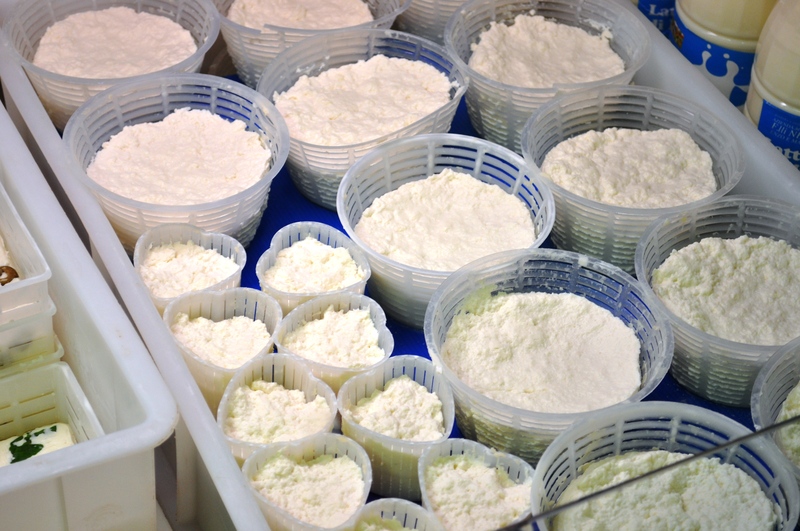 The latter can be at room temp, or even warmed a little to make it easier to cream. I tend to nuke cold butter for a few seconds in the microwave, or if I’m using a metal mixing bowl, put in a low heat on the hob briefly. 2. Beat together the whole egg and egg yolk. 3. Cream the egg into the sugar-butter mixture. 4. 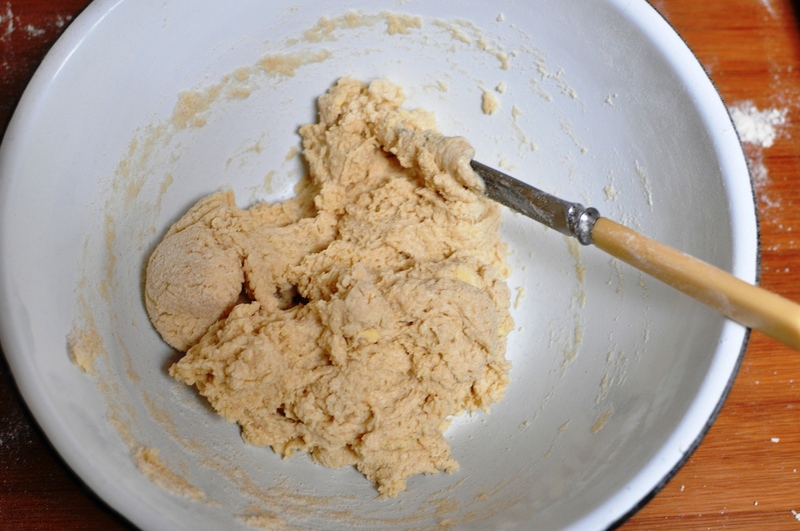 Sieve the flour into the creamed mixture, combine and bring it together as a dough. 5. Wrap up the ball of dough in plastic and put it in the fridge to rest, for about an hour. 1. Peel, core and chop the apples into 2cm-ish cubes. 2. Warm the butter, sugar, cinnamon and juice together in a saucepan. 3. 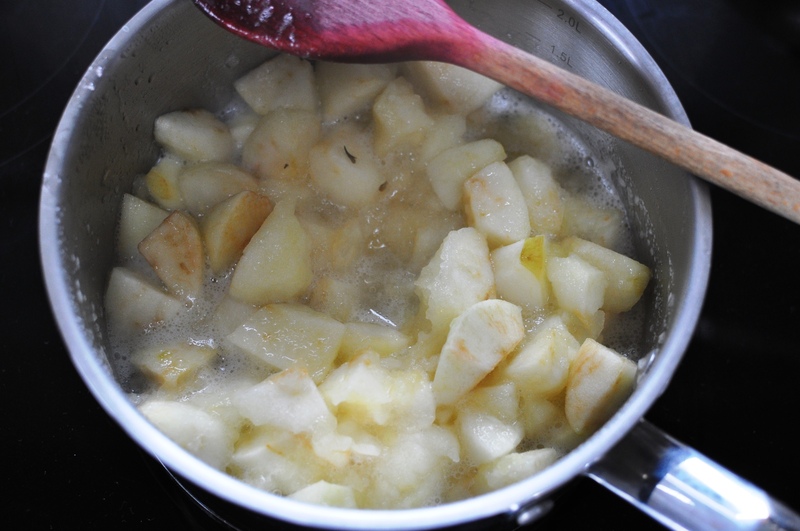 Add the apple pieces to the sugar mix and cook for about 10 minutes, stirring regularly to soften the chunks equally. 4. Cool the apple mixture. 1. Preheat the oven 180C. 2. 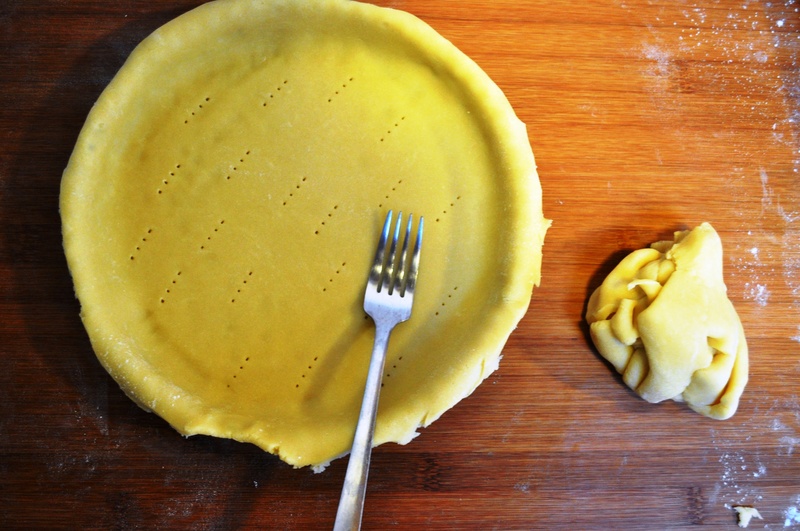 Cut a third of the pastry off the ball. 3. Roll the two-thirds chunk and use it to line a tin – in the show he used a 23cm loose-bottom cake tin, but Fran’s colleague in Rome lost mine (grrrr. Still annoyed about that, can’t find a non-non-stick replacement), so I used a 25cm loose-bottomed flan tin. You could use any sort of tin, around the same size (9-10 inches for you olde fashioned types). 4. This doesn’t need blind baking, so just add the cooled apple mixture. 5. 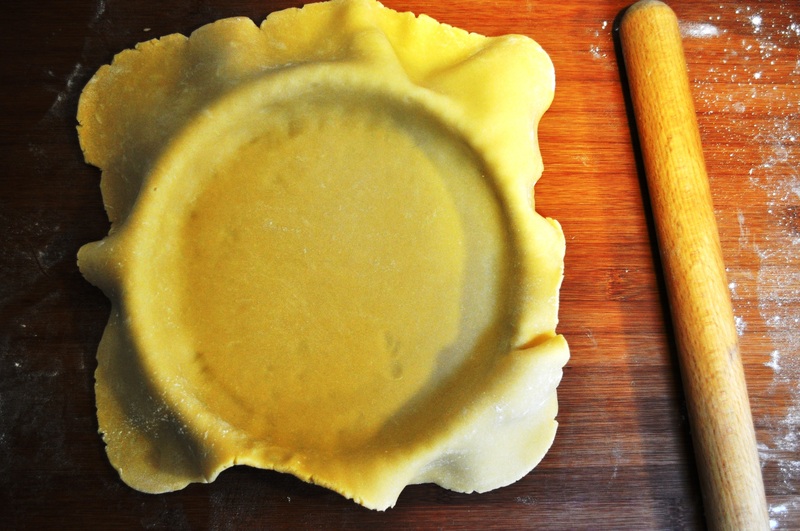 Roll out the remaining pastry and cover, sealing the edge with water. 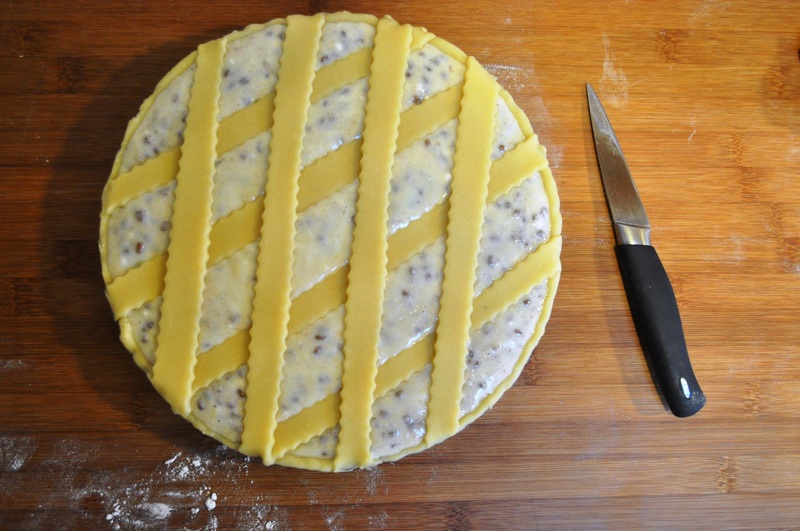 It’s not the easiest pastry to roll, but don’t worry too much, it’s so cakey, it bakes fine even if you bodge the pastry case together in pieces. 7. Brush the top with milk and sprinkle with caster sugar. 8. Bake for about 45 minutes, until nice and golden. 9. Leave to stand for about 10 minutes before serving. 10. Serve with his crazy sweet ice cream (seriously, I’ve got a sweet tooth, but that stuff was too much even for me), or some plain vanilla ice cream, or cream, or custard – whatever you fancy. Most importantly, make it using local apples. I urge you to track down local apples, support your local economy, support local producers, support your national economy, reduce the pollution of absurd food transportation. If you don’t have an apple tree, family or friends may have one they don’t harvest. Or you could politely scrump some by asking a neighbour. Even if the fruit looks ugly, it could be very tasty – and great for cooking up. And it’s free. Alternatively, stock up at a farmers’ market or farm shop. Failing that, ask for British apples in your supermarket. You should at least be able to find Bramleys as they store well and are available all year round. * I’m using the !!!! to indicate a “For flipping flip’s sake” moment as this country is not only just across a thin stretch of water from us, it’s in the same hemisphere with the same flipping seasons. ** Don’t get me started on pine nuts – I can’t find any pine nuts in Britain that are grow in Europe. Or even the US. They’re all from China. It’s boggles me, yet most people don’t even seem to notice.